It’s A Surprise Holiday Dinner Party! Thank you all for your continued support and dedication in aiding #SurpriseTheStruggling in making a change in the lives of so many people; especially those affected by Homelessness. We are asking that you will help us to surprise about 100 families (380ppl) this Holiday Season with a special Suprise Holiday Dinner Party. A way to bring some happiness and kindness this Holiday season. To let them know they are not forgotten. 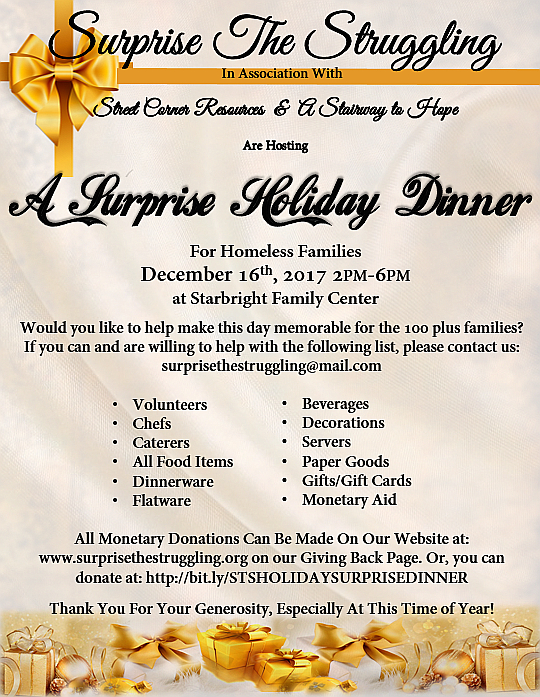 If there is any way you can assist us, please email us at, surprisethestruggling@gmail.com Make all Monetary donations at, http://bit.ly/STSHOLIDAYSURPRISEDINNER or on our Giving Back page. No amount too small, no item turned away. Please do us a favor, and pass along this Event. Share it on your page and in your communities. Let’s make a difference this holiday season. We can do this as a community!